The travel router I recommend is the GL.iNet GL-AR300M, which is – in one-line (provided by Amazon.com) – a “Mini Travel Router, Wi-Fi Converter, OpenWrt Pre-installed, Repeater Bridge, 300Mbps High Performance, 128MB Nand flash, 128MB RAM, OpenVPN, Tor Compatible, Programmable IoT Gateway”. I linked the internal antenna model of this router, which in my opinion is ideal as it is more compact than the external antenna model. Prior to purchasing the AR300M, I looked at various mainstream travel routers, such as TP-Link’s TL-MR3020, but ultimately decided that the AR300M is the best value and superior travel router based on its processor, build, storage space, and features. 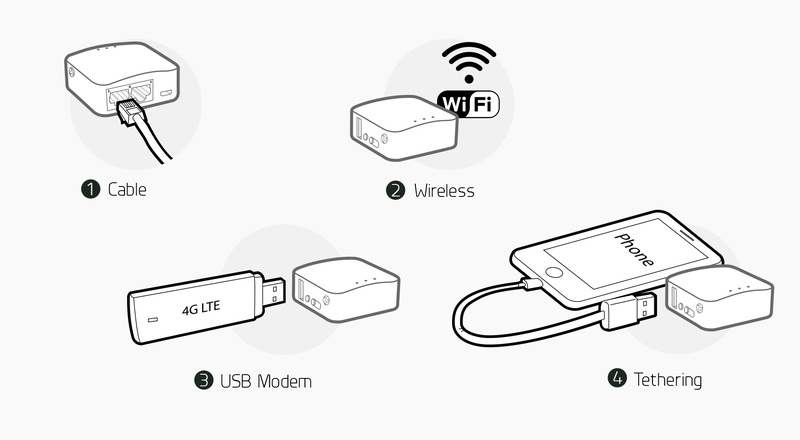 I particularly like how it’s powered by a Micro USB cable, which means you can easily plug it into a laptop or bring along a USB/AC charger, instead of other travel routers that plug directly into a power socket and are clunky and less flexible in terms of physical placement. More importantly, it supports VPN out-of-the-box. I’ll go through how to set up the AR300M with some personal recommendations sprinkled in for added security and privacy. 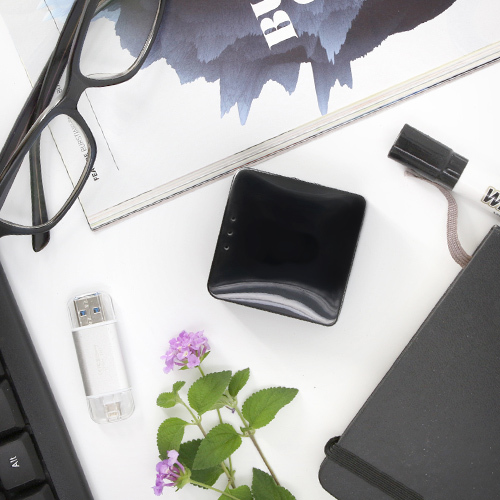 In the end, you’ll have a palm-sized box you can connect to an existing network – through a physical wire, USB modem, tethering using a mobile device, or even wirelessly – and have your very own secure wireless network. All devices connected to your wireless network will have all sent/received data encrypted. If you use a VPN set up according to my guide on creating your own superpowered VPN server, you will also have ads and trackers blocked for all devices. Now that we have our AR300M on the latest firmware, let’s set it up! 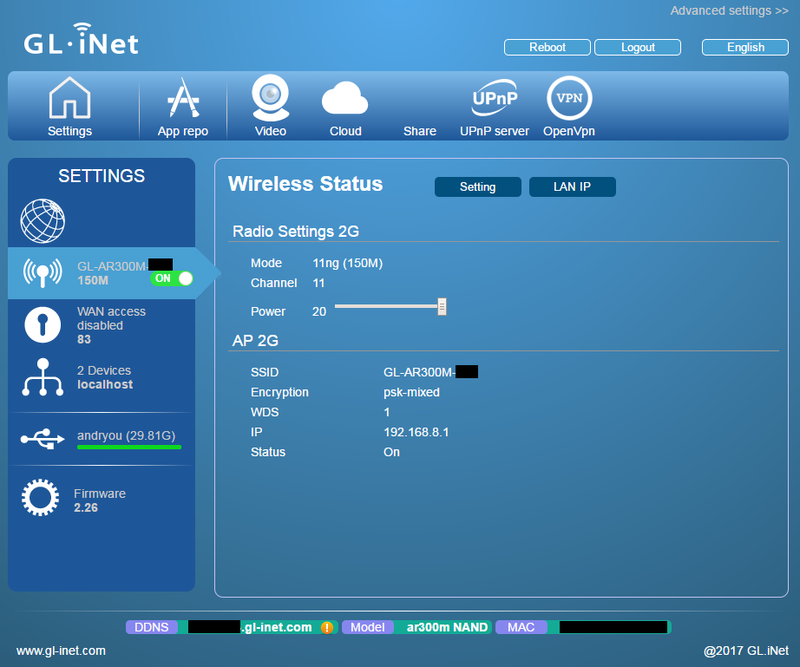 For advanced users, GL.iNet has created a simplified interface (the blue interface pictured above) on top of OpenWRT. Disable Auto-upgrade: ensure Auto-upgrade is disabled under Settings => Firmware to avoid having the box automatically upgrade itself while you’re travelling. It should already be disabled by default, but I am mentioning this just to reiterate. Disable WAN access: found under Settings => the third icon (key hole icon). It should already be disabled by default. Change Wireless Settings: found under Settings => the second icon (wireless radio icon). Disable UPnP Server: click on “UPnP server” in the top horizontal navigation menu and disable it. 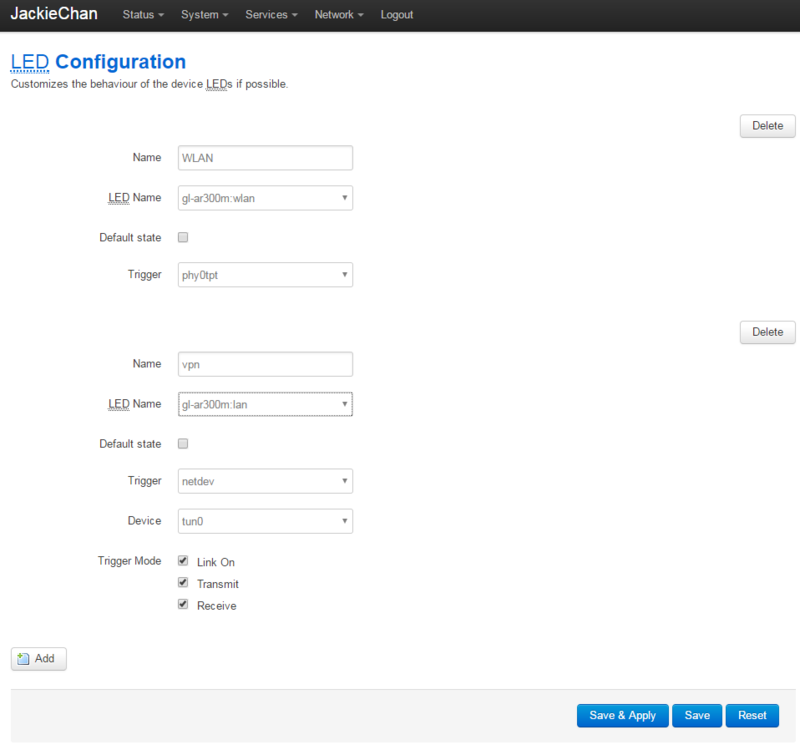 Change Device Name: go to http://192.168.8.1/ (or to the LAN IP you changed it to), click on “Advanced settings >>” at the top of the page, type in the password you set when setting up the AR300M, go to Network => Interfaces and click on the Edit button for WAN, and set an unassuming name for “Hostname” which host routers will see. I recommend either localhost or android-**lowercasemacaddress**, such as android-93c7edfdb42e (generate your own using this page: use the last format option (0010FA6E384A), and set to lowercase). If you stop here, you have a fully-functioning travel router that you can use to set up your own wireless network no matter where you are. However, you’ll be at the mercy of the host network you’re connected to. Let’s go further and add VPN into the mix, which will encrypt and securely route all traffic from devices connected to the AR300M through a VPN so that your host network and/or its Internet service provider can’t snoop on your traffic. If you’re already with a VPN provider check or inquire if they offer .OVPN profiles. If you are in need of a VPN provider, take a look at https://thatoneprivacysite.net/vpn-comparison-chart/ and focus on those with “Yes” under “Offers VPN”. Once you have a VPN profile in your hands, you can proceed to load it into AR300M. Once working, you will see an self-updating status message below the Apply button you clicked with the OpenVPN status, and in/out traffic amounts. The middle LED light on the AR300M will now be a solid green when successfully connected to VPN and will blink when there is VPN activity. This is extremely handy to know whether or not a VPN connection was successfully established without having to log into the web interface.